Halloween is probably one of the most beloved holidays for children. With all the delicious candy and fun costumes, who can blame them? Even if you’re an adult, there are still many reasons why people look forward to celebrating this spooky day. But one thing that spooks us here at Sun Valley Solar Solutions is how unsustainable Halloween is as a whole. The plethora of candy wrappers that are just thrown away, the multitude of costumes produced that are only worn once a year, and the waste of pumpkins are just a few items that we think can be improved upon. So in light of the festivities coming up, we wanted to share 4 easy tricks to make your or your child’s Halloween more green. In 2017, Americans spent an average of $70 per costume. This adds up to be a lot of unnecessary waste, both financially and environmentally, that could’ve been avoided by borrowing or making your or your child’s own costume. See what your friends are going as or if they have any old costumes you could borrow. Better yet, try your hand at creating yours from scratch. Both ways help to reduce the plastic waste and energy needed to create new costumes every year. Buying locally sourced and made treats is another easy way to green up your Halloween. Not only do you support your local community by purchasing from local businesses –keeping the money in your local economy – but you also help cut down on emissions and energy used for transporting candy. Another way to make your treats more environmentally-friendly is looking for treats that have minimal packaging or that are packaged in recycled materials. Decorations are one of the most fun things about Halloween, but it can also be one of the most wasteful. Second to only Christmas, this day typically uses a lot of non-recyclable plastics, but with a little creativity, decorations can be one of the most sustainable parts about your Halloween festivities. Using pumpkins and gourds can help create a natural, autumnal look. Cardboard boxes can be tombs and old egg cartons can be turned into bats. There are a ton of decorations you can create out of everyday things around your house. The later you buy your pumpkin, the less time it’ll have to rot. This is a useful thing to keep in mind because if you buy too early, you could be throwing it out before it’s even Halloween, which might tempt you to buy and carve another for the actual day. Buy it late enough to ensure it’ll be out on your doorstep for trick or treating. 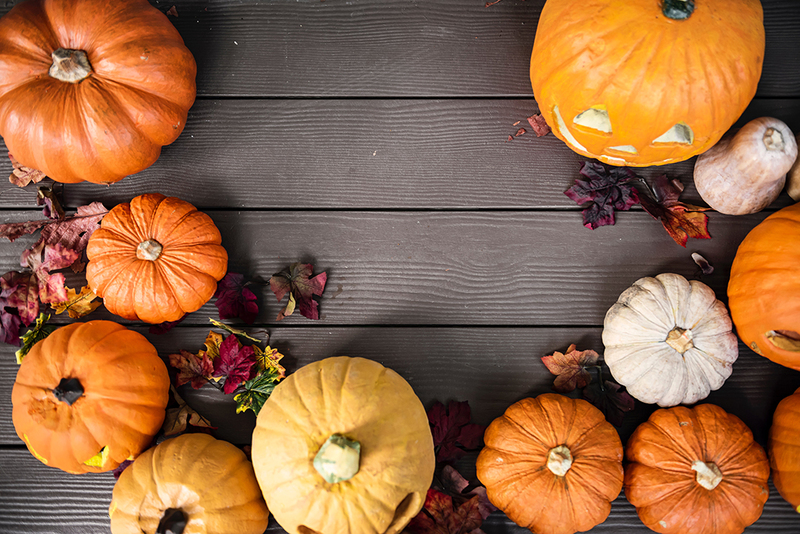 Buying from a local farm or farmer’s market is also a great way to green up your pumpkin. Another pumpkin tip: instead of throwing away the seeds after carving, try putting a little salt on them and toasting them for a tasty treat. Once you’ve gotten all you can from your pumpkin, compost the gourd to make as minimal of an impact as possible. If you’re looking for more ways to make your life more sustainable, we invite you to download our complimentary whitepaper: Is Solar Right for You? to explore if solar is the right choice for you and your home.